Fourteen year old Giannine Bellisario receives a birthday gift certificate for the local Rasmussen Gaming Center Virtual Reality Arcade. 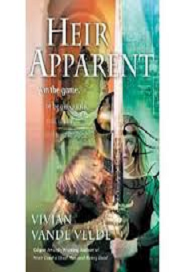 She enters a Total Immersion Game Room and chooses to play a dangerous new virtual reality game called Heir Apparent. Suddenly, Giannine becomes Janine de St. Jehan, a sheep herder in Medieval England and heir to the dead King Cynric. In this virtual universe, Janine has to play to survive, which is complicated by protesters from The People from the Society to Prevent Cruelty to Children (located in the real world) who are against the game; they create a glitch in Rasmussen’s ability to return her to the real world. Due to their inability to return her, Janine must win the game in order to come back. The only problem is that every time Janine dies, she must restart the game from the first stage. Eventually, the protesters take over the arcade, damaging equipment that controls Heir Apparent in their destructive wake. Because of this, Janine has to win the game in order to survive, all the while traveling through dangerous worlds, finding treasures, answering riddles, defeating barbarians, ghosts, and even a man eating dragon! Will Janine be able to overcome all these obstacles and make it out of the dangerous VR world of Heir Apparent alive?